Diving deep into unknown waters brings with it a sense of adventure and mystery. Beginner and experienced divers alike should always prepare for the worst, for safety's sake. Because literally, anything could happen during the dive, carrying a dive knife is a must for protection and other practical reasons. How are dive knives different than a typical pocket knife? What are dive knives made from? Where can I buy dive knives? Do I need a dive knife? What should you consider when shopping for a dive knife? You wouldn't want to be caught unprepared with the wrong kind of knife if, for example, you got hung up in a net, or get attacked by a fish. Understanding the different types of dive knives available is crucial because each has a specific purpose, and they're very different from your typical above-water pocket knife. Curious about dive knives? Keep reading to learn more before you make a purchase. 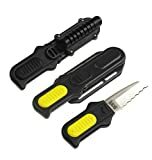 The best dive knife is much like an underwater Swiss army knife; you want it to be able to perform some tasks if necessary. 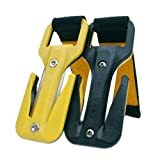 For example, most dive knives have a serrated edge or line cutter, which is useful when cutting any sort of binding material, like rope, fishing line, etc. Dive knives can also be used to make noise if necessary. When equipped with a fine, pointed tip, dive knives work well as a crevicing tool. Most dive knives are stainless steel or titanium. These metals do well in water and can stand up to much wear and use. A few of the knives on the market made of alloys perform in a similar way to titanium and stainless steel. Like most outdoor and recreational products these days, you can buy dive knives at your local outdoor supply shop, or online. Unless you feel confident about your purchase, it’s always good to go in and try out various knives before making a final decision, or at least to get an idea of what types of dive knives are out there. Like most emergency supplies, it’s always better to have a dive knife and not need it than need one and not have it. If you dive more than once a year, it’s probably a good idea to invest in a dive knife. Dive knives are typically 2-5 inches in length and may or may not come with a sheath, depending upon what style they are. Knife edges can be straight or serrated, and some knives even come equipped with both. Keep in mind the use you’ll want to get out of your knife as well. If you aren't using the knife regularly, a cheaper knife could be your best bet. However, if you are someone who dives a lot, it might be a good idea to invest in a quality knife you can depend on when things go south. 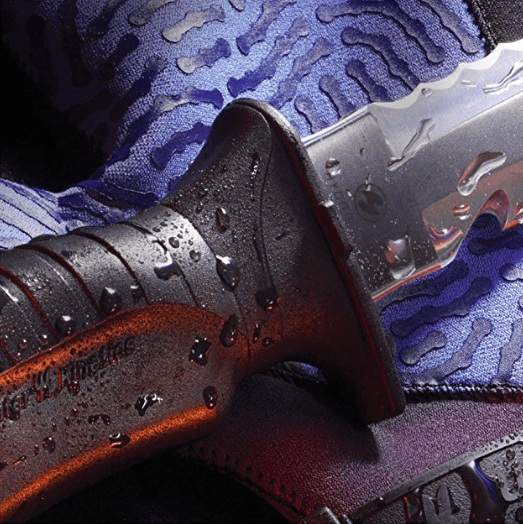 We’ve picked out the nine best dive knives available for online purchase, based on extensive research on various products offered in a variety of price ranges, qualities, and characteristics. After considering which dive knives receive rave reviews from real users, the myriad of benefits every individual product offers, and the price point we’ve come up with an unbiased “best of” list. Ultimately, it’s up to you to weigh your priorities and pick the best dive knife that suits your needs. We will offer strong recommendations, including the pros and cons of each product so that you can make an informed decision even if you don’t know anything (yet) about dive knives. Dive knives are available at a price point beginning around $10 and increasing to well over $100. It is a great price point to search in if you’re looking for a mix of quality and affordability. Characteristics between knives vary regarding metal construction standards, unique features, and versatility. A $35 dive knife might resemble a miniature pocket knife, while more expensive models have advanced attachment features and dynamic blades. In no particular order, here are the top dive knives of 2018 on the market today. Which will be your best dive knife? This 4-inch-long dive knife from EZ-Lock is available in Tanto and stiletto styles. Constructed from titanium, the knife sits comfortably in a locking sheath that ensures you won’t lose your knife during your dive. Equipped with serrations and a straight edge this knife is versatile and easy to use. 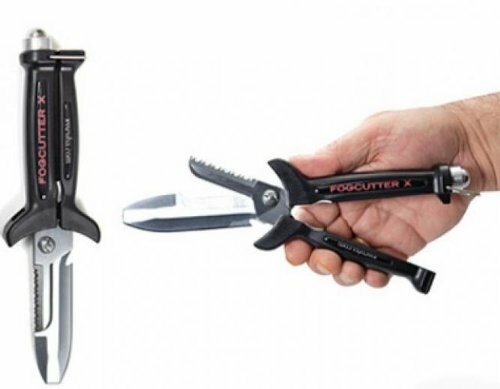 EZ-Lock’s dive knife provides multiple uses but is a tad simplistic in design. The plastic sheath will likely deteriorate before the knife does. However, this knife is covered by a 24-month warranty through Leisure Pro. The knife has a 4.5 out of 5-star customer rating on Leisure Pro. Characterized by the popular Tanto tip, this 3-inch blade from Aqua Lung includes a locking sheath. The blade itself is titanium and fits snugly in its sheath, which you can mount in a variety of locations. Some divers might prefer sheaths that are not locking, but they can come in handy. The ability to mount this dive knife anywhere makes it a great choice if you prefer the knife to be in a unique spot where a traditional sheath may not suffice. 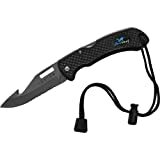 Customers interested in this dive knife can expect to spend a little cash. A 2-year warranty protects this knife. Leisure Pro customers have given it a rating of 4.6 out of 5-stars. Measuring 2.8-inches in length, this dive knife from TUSA is made from 304-grade stainless steel. 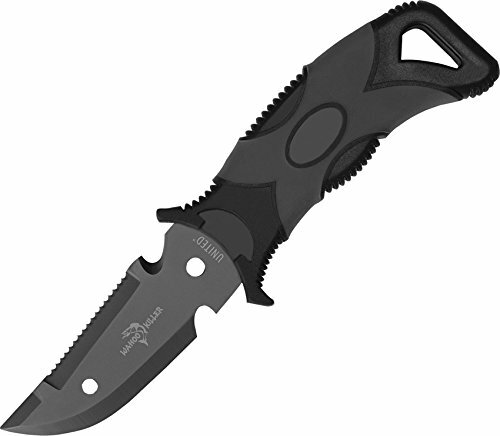 Customers who purchase this knife will also receive a plastic, corrosion-proof locking sheath. Knives are offered in multiple color schemes. Plastic sheaths should be upgraded to more durable materials whenever possible. You can find it for sale on Leisure Pro’s website, where they advertise a 1-year warranty on this particular product. Leisure Pro’s customers have rated it 4.7 out of 5-stars. 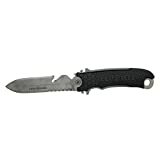 This all-black, stainless steel blade features a serrated edge and line cutter. Measuring 6-inches in length the blade includes built-in shears in an innovative, patented design. A quick-release locking sheath completes this package. While the shine of stainless steel and titanium blades can scare away wildlife, dark blades can be difficult to find in the depths of deep waters. However, this capable blade wins style points. Dive Right in Scuba customers have rated the knife a little over 4.0 out of 5-stars. Underwater Kinetics’ nearly 3-inch-long blade comes from metal alloys that mimic the strength and added corrosion resistance of high-grade stainless steel. The dive knife features a serrated edge and a blunt tip. The same material comprises the accompanying sheath and knife’s grip. Some divers might prefer larger knives, while others seek out small knives like this for specific uses. Leisure Pro’s customers have rated the dive knife 4.5 out of 5.0 stars. Offered in a variety of colors, including glow in the dark, this dive knife from EEZYCUT contains the efforts of American workers’ hands. The knife itself measures about 3-inches in length, but it does not resemble your typical knife. Rather, it is a sheathed, double-sided razor blade made from 440A stainless steel. Though this innovatively-designed knife still accomplishes the same cutting tasks as a typical dive knife, some might prefer a traditional form. Leisure Pro’s customers have rated it 4.8 out of 5-stars. With a 3-inch long blade comprised of stainless steel, this knife from United Cutlery is accompanied by a standard sheath. This blade has a blunt tip and a rubber handle. There are many other knives on this list, let alone available online, which are better investments. Amazon customers have rated it 3.5 out of 5-stars. Available in black and yellow, this titanium knife with Tanto tip measures 4.5-inches in length. The knife features a line cutter and serrated edge for a variety of uses. The patented sheath that accompanies this knife is lockable but springs free quite easily. For those who like to attach their knives with a line, the handle on this knife is perfect. It features a dedicated hole for looping paracord — or any cord for that matter — through. The knife has a 24-month warranty, and Leisure Pro customers have rated it 4.7 out of 5-stars. Complete with a serrated edge, line cutter, and locking lanyard, this red-handled dive knife has a 3.5-inch-long titanium blade. Because it is a folding knife, like many pocket knives, it doesn’t come with a separate sheath. Some divers might not like this specific design, especially if they are wearing gloves, as the blade itself might prove difficult to extend. The red handle does make it stand out. The knife has a 12-month limited warranty. Leisure Pro customers have rated the knife 4.5 out of 5-stars. Given the range of competitors in this particular segment, we found the Underwater Kinetics Remora Compact BC Knife to be the best dive knife. Where other knives came with plastic sheaths, this knife is stored in one that resembles the same material as the grip. However, all of the dive knives on our list are pretty great. You can't go wrong no matter which one you buy. Do you have a favorite dive knife that we did not list? Let us know in the comment section below!